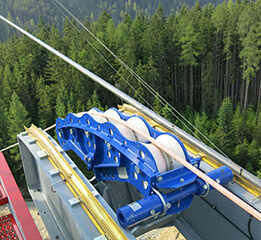 TEUFELBERGER mounting ropes are ideally suited for the installation and mounting of electric lines and ropeway ropes. 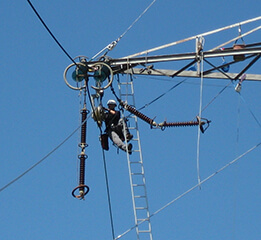 The ropes we use for this purpose are high strength fiber ropes, either with or without cover, for utility line construction, installation ropes for ropeways, or synthetic ropes for motor winches. Whether you use a drum winch or a capstan winch, we have the right rope for each of your applications. Our fiber ropes weigh 7 times less than steel wire ropes. Synthetic ropes from TEUFELBERGER can be used in your existing equipment without the need for adaptation. We offer highest breaking forces, which are sometimes higher than those of a steel wire rope of the same diameter. We provide increased safety and control due to torsion and stretch indicators in the rope cover. We manufacture optional lengths according to customer requirements - without any length limitation. Our mounting ropes are characterized by perfect spooling behavior on all kinds of winches. We are flexible in terms of design: differences in color facilitate your work and permit an easier identification by diameter, year of manufacture, and much more. 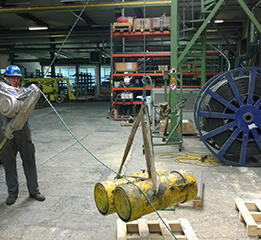 Our mounting ropes feature an extremely high abrasion resistance and minimal stretch - which is important when tensioning ropes over longer periods of time.